Superman/Batman: Finest Worlds, Michael Green and Mike Johnson's second volume of the series, hearkens strongly back to the classic World's Finest series. 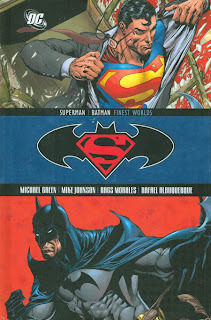 In the spirit of the kinds of adventures where Superman and Batman competed for the heart of an alien princess or Bruce Wayne joined Clark Kent at the Daily Planet, Finest Worlds offers three tales, almost Elseworld tales, that mix and mingle the elements of Superman and Batman. But while the wackiness found within well distinguishes this volume, it does unfortunately hurt the overall relevance of the stories. The main story, "Superbat," finds Superman's powers accidentally, and magically, tranferred to Batman. What follows is by and large exactly what you'd expect: Clark Kent tries to adapt to a normal life while Batman uses his new powers first to clean up Gotham, and later to try in a fit of stark raving madness to eradicate all crime everywhere, until Superman and the JLA must step in to stop him. The writers get no points for bringing any new insights to the characters of Superman and Batman, but yet the story is filled with lots of little moments: Superman teaching Batman to use heat vision, Supergirl's surprisingly moving grief when Superman is injured, Super-Batman fighting both Bane and the Justice League. The story benefits overwhelmingly from art by Identity Crisis's Rags Morales, giving it the semblance of a weight it otherwise wouldn't deserve. The difficulty with "Superbat" -- and also the funny, charming "Lil' Leaguers" story that sees Superman and Batman teamed with cartoon dopplegangers -- is that they're magic-based stories where all the toys go back in the toybox at the conclusion. Possibly this was editorially-mandated (and possibly, I've heard, the reigns will be looser on Superman/Batman post-Blackest Night), but the writers' previous volume, The Search for Kryptonite, had no such problems. Kryptonite was surprising and interesting and deeply rooted in the current events of the DC Universe; Finest Worlds is a satisfactory volume of Superman/Batman, but it lacks the "oompf" of the previous book. That said, I must praise the writers for "The Fathers" (which marked the fiftieth issue of Superman/Batman). Surely Green and Johnson aren't the first to posit a meeting between Thomas Wayne and Jor-El, but I loved the mid-issue tease that it all might be a dream -- and finally the revelation that the meeting in fact took place. I hold no illusions that any other writer will ever reference the event ever again, but I credit the writers for "going for it" and not taking the easy out found in the book's other two stories. The truth is, despite that Finest Worlds is another step away from the direction Superman/Batman needs to go if this title is going to last (read: relevancy), the book is plain, old-fashioned fun. The outlandish campiness of the parallel Superman/Batman narrations (begun by Jepf Loeb and continued here) virtually ensure these stories can't be taken seriously, so there's no choice but to sit back and let them wash over you. Ultimately I decided to view these stories like episodes of the Superman or Batman cartoons, and only then did I feel I really "got" their intended tone. Out of curiosity, these volumes aren't numbered anymore, right? It was kind of annoying when that continued on for a bit past Loebs run in the collected editions. My hardcovers are only numbered up to vol. 3 (whereas Loeb's run ended with vol. 4). Don't know about the paperbacks. The numbering on DC trades is funny; it has seemed sometimes they stop numbering when the numbers get too high (so as not to make it seem like a new reader can't start buying a series). I'm surprised Teen Titans is up to number 10 on the spines. That's good. I was worried they were continuing that. With a title like Superman/Batman, I like to be able to pick up the trades I want and being as I am a gap in volume numbering is annoying. I think they should start using the numbering only to denote volumes in the run of a creator or the like. Like Jeph Loebs run. The four trades numbered 1-4. Then do away with it until another creator comes aboard. It would make more sense. That or to do away with numbering for anything but volumes of the same story. I mean, they're not really necessary. Does anyone know if there is going to be a paperback? I think it hasn't been announced yet!? Of course. There's always a paperback. But they usually don't pop up until about five to eight months after the hardcover release. I agree that high numbering may discourage a new reader from the series, but personally, because I kinda want the whole series, I like having the numbers there so I know what order to buy/read them in. But I guess that's why things like the DC Trade Paperback Timeline exist! Extra points for the timeline plug, Mark. :) How's the new page/location/layout working for you? I think integrating the timeline into this site was a great idea. The old layout (and the annoying Geotools bar on the right) seemed WAY outdated. I also like how the links to your reviews are right there. But it seems like some titles are missing; for example, your page from a while back titled "Countdown to Final Crisis trade paperback reading order" has 52 Aftermath: Black Adam and 52 Aftermath: The Four Horsemen, but neither of those titles are on the main timeline. Also, as a collector of the Green Lantern & GL Corps trades, I'd like to see entries for those collections prior to The Sinestro Corps War. I've had to go "elsewhere" for info on the order of those volumes. Hey has anyone watched Superman/Batman: Public Enemies yet? I was wondering if I should watch the movie or read the book first. I'm planning on doing both, but was wondering if one would "spoil" the ending of the other, and if so, then which to enjoy first? I don't think it really matters; both endings are similar, though they get to that point fairly differently. I found the book to be big, dumb and a lot of fun. The cartoon was just big and dumb. Maybe you'd get more out of it if you watched it first, then read the book. Let me respectfully disagree with Jeffrey there -- the book came out first, so I'd read the book first. The movie can only be "understood," if you will, "in conversation" with the book; that is, whatever is or isn't in the movie has to do with changes the movie-makers made based on their reactions to the book. There's no "resonance," so to speak, if you watch the movie first. Just my two cents. Sorry you feel that way. I don't think that's the case -- on the front page at this very moment, I liked Superman: New Krypton, Batman: Whatever Happened to the Caped Crusader, and Final Crisis: Rogues' Revenge, and I saw some positives in Terror Titans and Superman/Batman: Finest Worlds. I've actually found the reviews on this site to be really great (whether I agreed with them or not). Compared to the shorter reviews I read on Amazon when deciding if I'm going to buy a paperback, Collected Editions really seems to get to the root of the story, or themes of the story, or intent of the story. No story is perfect, and so most (all?) reviews raise good and bad points about each book. As a specific example, go read the review to Battle for Bludhaven, and then go check it out on Amazon (where it got 2/5 stars). I had originally decided to skip the book, then ended up getting it anyway. And while it's not great, I was satisfied enough that it justified the purchase. Back to the Public Enemies question, I guess CE has a good point about reading the book first: the movie is probably made on the assumption that people have read the book first, or are otherwise familiar with the story. It's not like a Hollywood blockbuster where they basically have to make the movie self-contained because most viewers wouldn't have read the comics, even if they're familiar with the character. The target audience of S/B: PE is certainly those people who were likely to have read the book in the first place. 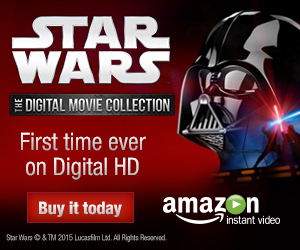 I stand by my suggestion that you watch the movie first. I don't recall the movie making the assumption that the audience has already read the book, but it was such a lesser work compared to Jeph Loeb/Ed McGuiness's thing (which wasn't exactly great to begin with) that I think you'll get more out of it without having the book to hold up for comparison. YMMV, naturally. Anonymous: it's pretty obvious you haven't been reading this blog for very long. God knows CE's written by far the smartest, most positive review of Identity Crisis (of all things) I've read anywhere. What I appreciate about CE's reviews is that he actively engages in the work, instead of just being a passive reader, and he brings in new perspectives I'd never even consider. You don't get much of that kind of critique from most reviewers, other than the standard "OH GOD THIS SO AWESOME LOLZ" you can find anywhere. Hey sorry to get back to this thread, but I was reading Public Enemies (ended up buying the book and the movie on the same day!) and there's a hero in there I don't recognize; she gets trapped with Superboy in one scene, has a black outfit with a red "S" on it, and dark hair. I got the impression she was some sort of Supergirl-type character, but I have no idea who she was or why Superboy didn't seem too fond of her? That's Cir-El, the short-lived Supergirl from Steven T. Seagle's run on Superman (about Superman #190-200). She was supposedly Superman and Lois Lane's daughter from the future, but turned out instead to be a street kid brainwashed for this task. She appears again in Superman/Batman: Vengeance amidst various other alternate reality Supergirls.